A gift to the Learning Potential Fund helps students from all backgrounds reach their full potential. Every gift has an impact on the lives of our students. Give our students opportunity through the Learning Potential Fund and Law Founders' Scholarship. Help grow our research, allowing us to create new hope in health and new solutions to better society and the environment. Grow our opportunities to have 'real links' with the community and provide university facilities for people of all ages and from all walks of life to embrace, whether as students or visitors to our campus. A development fund to support new alumni initiatives and grow the alumni engagement program. A program visiting schools every day of the school year to deliver free, hands-on science activities to primary and high school students. 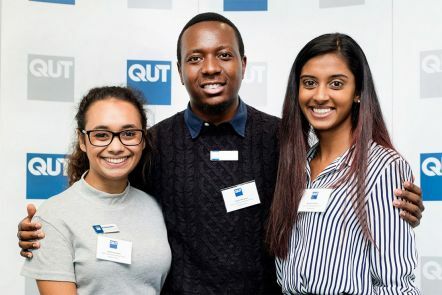 This fund recognises and supports a Creative Industries Faculty acting or technical production student to assist them in pursuing professional development opportunities following their graduation from QUT. A scholarship for current undergraduate students studying nursing. A fund to support the restoration and recreation of the historical Old Government House Library. A fund supporting the collection established in 1945, currently held by the QUT Art Museum. This fund provides support for the QUT Art Museum, a cultural hub at the Gardens Point campus which hosts art exhibitions, the QUT art collections, and regular programs such as book clubs. This fund supports the QUT Libraries, which provide students with a wide-range of resources to enhance their learning. A fund to provide support for cultural public programs developed by QUT Precincts. A fund to assist students who take part in practical experience in rural areas. This fund recognises and supports individuals and organisations who undertake research that advances civil unmanned aircraft systems. A scholarship for current undergraduate and postgraduate coursework students majoring in marketing. You can give to any of these funds by completing our downloadable gift form (PDF file, 160.8 KB).